This program is aimed at people who want to design their interior quickly, whether they are moving or they just want to redesign their existing home. Numerous visual guides help you draw the plan of your home and layout furniture. The user may draw the walls of his rooms upon the image of an existing plan, change the color or the texture of the walls, draw dimensions, drag and drop furniture in the plan from a catalog organized by categories (living room, kitchen). 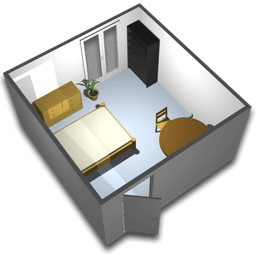 You can import additional 3D models created by himself or downloaded from different Web sites, change the size, the orientation and the elevation of each piece of furniture with the mouse. Sweet Home 3D allows you to view the changes in the plan simultaneously in the 3D view, either from an aerial view point, or from a virtual visitor view point, print the home plan and the 3D view. Each change in the 2D plan is simultaneously updated in the 3D view, to show you a realistic rendering of your layout. Sweet Home 3D may run on Windows, Mac OS X 10.4 to 10.11, Linux and Solaris. Fixed a bug that prevented to export to CSV format. Improved printing perfomances under Mac OS X with Java 8u152.